Teenage Jade's unusual supernatural gift seems like a curse. It frightens her and interferes with her already complex life. Living on Nantucket Island with her mother who is about to remarry is complicated enough. Jade rarely sees her father or her paternal grandparents whom she loves and misses. Then there's Charlie her soon to be step brother who she is crushing on. 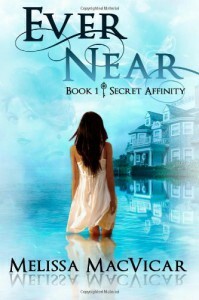 Fair Ever her new family home proves more challenging than she imagined. Only she can see the sad, tormented ghost who lives there. Terrible nightmares threaten to reveal her secret and Charlie who sleeps across the hall starts to suspect something is amiss with Jade. As they become emotionally attached Jade's gift threatens to destroy their new-found feelings. Jade is a lovely character courageous and vulnerable as she battles with entities she cannot fully understand. She turns to the local ghost hunter for help but he only wants to exploit her gift. Dealing with him matures her and proves she isn't a victim. Until Charlie realises her secret only in her journal can Jade record and make sense of what she sees. Charlie is a great young hero willing to support and protect Jade despite his misgivings about the truth of Jade's stories. The story is interesting and well paced and Jade's observations about the community humorous. I particularly liked the descriptions of the ghosts which produced vivid images in my mind. The plot is full of suspense as Jade faces conflict on all sides. Help from an unexpected person makes the ending of the story satisfying and believable.